The iKettle allows you to remotely boil the kettle from anywhere in the house. This means that tea fans can wake up to the perfect brew or have one waiting on them as they get home from work. 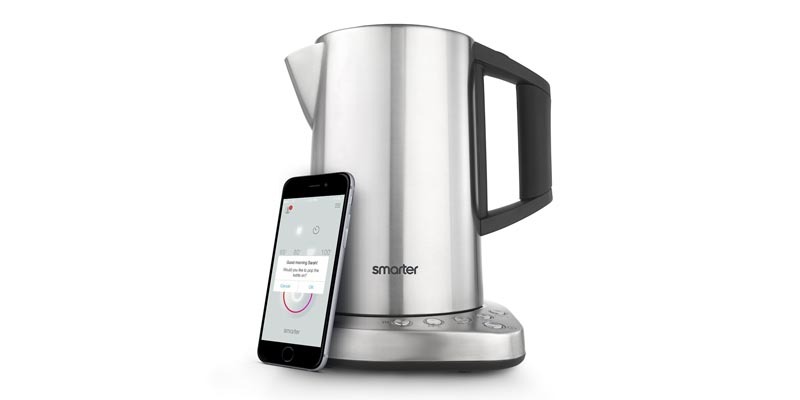 You can control the water temperature remotely and the Smarter app “Early Bird Mode” can even monitor local traffic reports and wake you up earlier with the kettle on so you still can have a nice cup of tea and get to work on time! The water level sensor shows you exactly how much water is left to avoid switching on remotely when the water level is too low. You can also set any temperature between 20 and 100 degrees centigrade to get the best taste from your chosen tea, useful for those who enjoy a selection of different hot drinks and not just tea, plus great for sterilising baby bottles as you can select 100 degrees Celsius to sterilise the water. The brand new iOS and Android App has been re-designed with many new features, but is still simple and intuitive to use. Almost everything is customisable and you can schedule the iKettle to begin heating at any time to make sure you get the best start possible to your day. The iKettle will welcome you home as you walk in the door and will ask if you would like to boil the iKettle! The stylish iKettle has a capacity of up to 2 litres which will provides enough water for up to 10 cups of tea or coffee. It might seem a bit frivolous to have a wifi kettle, but on average in the UK we typically waste up to 33 hours per year waiting for the kettle to boil! The Smarter app even allows for multiple users, so up to 4 users can be connected at any one time to schedule their next cuppa!